The first new product is a wall mounted 3-gun locking rifle/shotgun rack for gun owners having just a few firearms ($49.95). Similar to the 9-gun rifle and shotgun rack, it uses very minimum wall space for mounting and will hold up to 3 rifles and shotguns of most all types. The second new product is a wall mounted locking gun case rack ($39.95) for locking away those hard-sided gun carrying cases with gun inside them which are normally are stored unprotected underneath beds, in closets, etc. making it susceptible to thieves and children. Previous sales of Mr. Graham's line of locking gun racks have totaled almost ½ million dollars to date and have been sold all over the world with retail customers ranging from homeowners, law enforcement agencies, a top U.S. Security Agency to different branches of the U.S. Military. Some have also been purchased to appear in the set design of an upcoming Hollywood movie to be released in early 2009. 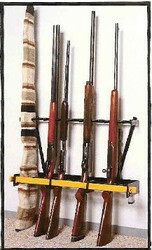 These reasonably priced gun racks can only be purchased through Firearm Security Racks Inc. website.